When I moved to New York, the city influenced my style a lot. I traded in my terribly uncomfortable shoes for booties and I found myself wearing loads of black. 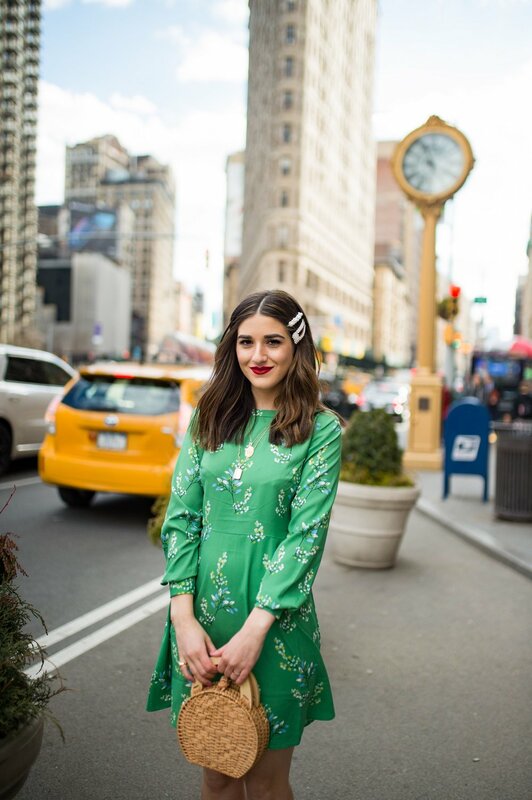 It took me a few years to get back to my colorful roots, but I’m so happy I did because this green floral dress is giving me all the spring feels. LOFT’s entire new collection is actually everything I would want for spring, from their Back Cutout Ruffle Hem Dress to their Beach Vine Ruffled Back Cutout Dress. I’m clearly a girly girl at heart and I'm swooning over the feminine dresses in new arrivals. Aside from all the cute new pieces, I love how LOFT continues to bring size inclusivity to the table, season after season. It’s not always easy for me at 5’3’’ to find clothes that fit perfectly without having to alter them, but LOFT’s petite collection was made for my size. Thanks to LOFT, petite girls everywhere no longer need to cuff pants three times or hem awkward length dresses. And the best part - - midi skirts, like this adorable Tie Waist Pleated Midi Skirt, actually fit like midi skirts on us short girls. I can’t even tell you how many midi dresses I’ve bought (and returned) that wound up hanging below my ankles, so YAY for size inclusivity! LOFT also offers plus, maternity, and tall options, to make sure every woman can find her perfect fit. I could get lost on LOFT’s site right now since there are so many good options, but as green is trending for spring, that’s the perfect place to start shopping. If you like my dress, you’re bound to be a fan of the matching fabric Flower Branch Wrap Skirt and V-Neck Flutter Shell. Make sure to let me know your favorite LOFT pieces down below in the comments! * Thank you LOFT for sponsoring this post!